Wooden plaque - We have purchased these from the craft store where they are available with decorative routed edges, or made our own from pine. The exact size is not so important, but an 8" x 8" or 8" x 10" will work well if your polished stones are large (the size of a nickel to a quarter), and a 5" x 5" or so if you use smaller stones. Sandpaper - to use on the wood plaque before painting, if the surface is rough. Polished stones - These are available in craft stores. Choose whatever you like. 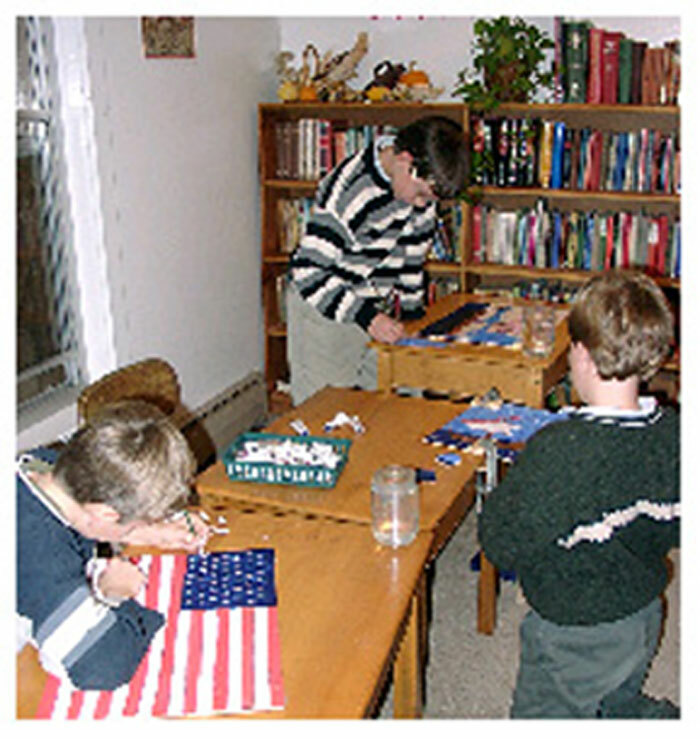 We have used both multi-colored and more natural tones. Glue for the stones - Barge cement. Gorilla glue would probably work, but since it expands as it dries, be sure to use just a little. White school glue does not hold the stones well. Letters - pre-made wooden letters IC XC NIKA from the craft store, OR, adhesive-backed letters (stickers) from the scrapbook department. Select the size of the letters based on the size of your plaque. The letters will need to fit inside the arms of the cross. If you use wooden letters, you can attach them with glue and color them with a permanent maker. Picture hanger - to attach to the back of the finished plaque. 1) Sand the plaque, if necessary, and paint gold. 2) When the paint is dry, place polished stones in design of an equal-armed cross and glue in place. 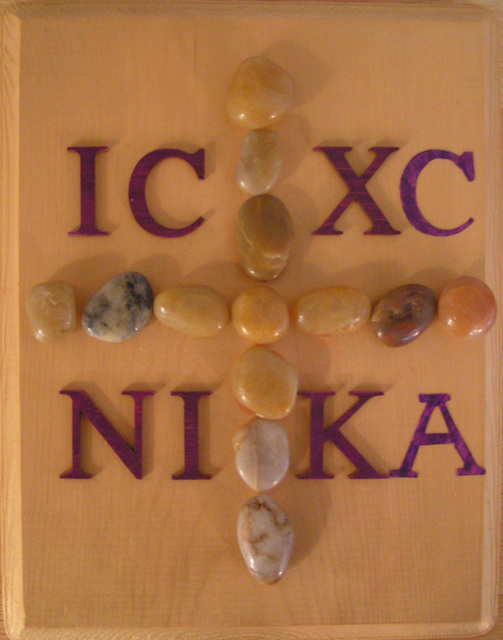 3) When the stones are secure, place the letters between the arms of the cross. If you are using wooden letters, you can color them using a permanent marker. 4) Attach a picture hanger to the back. Hang and enjoy. We then cut a 1/4 inch thick piece of plywood the same size as the paper with the drawing. We took a piece of carbon paper and put it between our drawing and the wood. We then traced along the basic outlines of our drawing so that we had a basic outline of our drawing on the wood. Then we painted the drawing on the wood. We used tubes of water color pigments, mixed with water. Then we took our paper drawing and experimented by drawing lines with a pencil to figure out how we wanted our puzzle pieces to be shaped. We then used a pencil to draw the shapes of the puzzle pieces on the board. We used a coping saw to cut along the lines we had drawn. After the puzzle was all cut apart, we lightly sanded the edges of all the pieces. After that, we made a frame with a bottom and sides, just big enough for the puzzle to fit inside.